It was the evening of Sunday, 16th September and Adrian and I were skyping his parents in New Zealand to wish his mum a happy birthday for Monday, 17th September. Throughout my pregnancy we had remarked how funny it would be for baby to share their nana’s birthday but had dismissed this as unlikely. My due date had been and gone, 09th September, and I had a scheduled 41 week antenatal appointment for the next morning. I wasn’t particularly looking forward to the appointment given a midwife’s prior suggestion I ought to be having a sweep and then potentially an induction (which she had gone ahead and booked for the coming Friday). All had progressed really well during my pregnancy and so I had hoped to welcome my baby into the world when it was ready with little intervention. I had been having light stomach cramps during the day but soon after skyping and eating dinner these increased to surges. At around 9pm I asked Adrian to start timing the duration and frequency on an app he had downloaded to his phone. We set about cocooning ourselves in our bedroom with the lights off, relaxing room spray spritzed, and the birth ball to hand. The intensity of the surges continued to increase through the night and I found it most comfortable to be knelt on the floor with my head and arms resting on the bed. By 7am Monday morning, the frequency of my surges was roughly three every 10 minutes and the length of each was a minute. We decided to call St Thomas’s to speak with a midwife so they were aware as to how I was progressing; equally, to convey I wouldn’t need my 41 week antenatal appointment that morning! The midwife we spoke with was lovely and we all agreed that we stay in the comforts of home to see whether my surges continued to advance. I was most happy being at home with Adrian in the calm and quiet, equipped with breathing and visualisation techniques learnt on Zoe’s hypnobirthing course. I have always found it difficult not feeling in control of a given situation and will immediately start focusing on every possible worst case scenario. Hypnobirthing practices really diverted my thoughts to those things I could control during pregnancy and labour, particularly the value of remaining calm and centred during labour to enable the release of oxytocin. At 11am after spending a good few hours in a warm bath, my surges were well and truly every two to three minutes and a consistent minute in duration. We called St Thomas’s again and were told we should make our way to the hospital. We called an Uber and were fortunate to have a very understanding driver who carefully navigated speed bumps and wasn’t thrown by my noises and loud breathing through my surges. We got to the hospital’s midwifery led ward given my hope to have a water birth with little intervention. I recall there being quite a few people stood around the ward reception area while I braced myself against Adrian through another surge. We were quickly shown into an assessment bay and a midwife asked if I would like an internal examination while making it clear to me that this was totally my choice. The amount of pressure on my pelvis was quite intense and so I said I would like the examination to see how things were progressing. The midwife examined me and conveyed I was five centimetres dilated and asked as to my birth plan. I wasn’t at all thrown given I had ensured I was mentally prepared to change my preferred birth plan if need be. My focus continued to be on remaining calm and centred. When I had been examined at 11.30am the midwife conveyed they would wait a further four hours to examine me again. In the meantime, I was moved to a room on the obstetrics led ward. Ironically, my blood pressure dropped once I had moved rooms and was once again in a quiet space away from the assessment bays and ward reception. I was asked as to what pain medication I would like, opting for gas and air. I was told I could transfer to the midwifery led ward but in the meantime, an allocated midwife Camille, had been in to see me. I was now feeling unbelievable pressure low in my pelvis and the overwhelming need to push. Camille asked if I would mind being examined given how I was feeling. On examination, I remember Camille suddenly saying to Adrian and me that baby was coming! I felt both safe and supported. 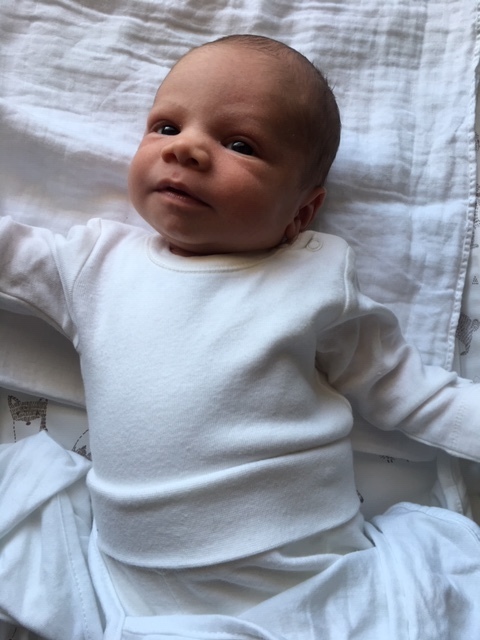 Our lovely little boy, Artem, entered the world at 2.38pm on Monday, 17th September weighing 7 pounds. I did sustain a tear and needed stitches which was realising one of my biggest fears. Thankfully, this wasn’t nearly as traumatic as I had anticipated and the healing process has been straight forward. We spent the rest of the afternoon alone with Artem enjoying skin to skin time and the wonder of being a new family of three. Adrian and I have both laughed how wrong we were to assume Artem wouldn’t arrive on his nana’s birthday - he clearly had designs on this date which makes it even the more special!